Buried is not for anyone faint of heart, claustrophobic, or dissatisfied with their wireless phone carrier. Instead, its narrow target audience is those looking for a minimalist, visceral movie-going experience in the same vein of – but not quite as affecting as – the deep sea horror-thriller Open Water. It is clear from the outset that director Rodrigo Cortés aims to fashion a Hitchcock-influenced homage, starting with an opening credits role and theme music seemingly patterned after Psycho. The film opens with a full minute of darkness, broken only by the sound of heavy breathing as a man named Paul Conroy (Ryan Reynolds) awakes to find himself gagged and trapped inside a coffin. Indeed, the entirety of Buried is set inside Conroy’s casket – think Tarantino’s Texas funeral segment in Kill Bill, Vol. 2 stretched over 95 minutes. Cortés’ shifting camera angles and clever plot devices, however, allow the audience’s mind to escape the wooden tomb, even if their eyes never do. The puzzle over how and why Conroy ended up being buried alive – together with learning the background of the one-man protagonist – is slowly pieced together using a Zippo lighter, knife, pencil, and cellular phone that are mysteriously buried along with Conroy. We soon learn that Conroy is a truck driver working as a KBR-type civilian contractor in Iraq who last remembers his convoy being attacked by insurgents. The cell phone – with a signal strength that puts Verizon and certainly AT&T to shame – becomes the window into discovering who took Conroy hostage and locked inside a pine sarcophagus. Moreover, writer Chris Sparling smartly conveys how Conroy’s kidnapping becomes an international incident that begins with amusingly incredulous 911 and FBI operators before giving way to a predictable, repugnant heap of corporate, military, and political damage control. Technology brings the fate of a fellow female contractor into play. And, Conroy must also come to grips with the regrets in his life, including how taking a dangerous, overseas job strained relations with his wife and son. His brief goodbye phone call to his dementia-ridden mother paints a more poignant picture than an entire Nicholas Sparks’ weeper. All this…without ever leaving the confines of the coffin. However, Buried’s brilliance too often gives way to partisan pandering, particularly when Conroy’s conversations with Dan Brenner (voiced by Robert Paterson), a military hostage locator, drift into a larger critique on the Iraq war itself – “I didn’t know it was going to be like this here,” wails Conroy; “I don’t think any of us did,” Dan somberly replies. The film’s frantic final act breaks away from its psychological moorings and takes on the appearance of another Saw sequel. Still, the audience is never allowed to slide back from the edge of its seat, not just because of Cortés but also the yeoman effort of Reynolds, whose credits are primarily populated by comedic and sci-fi roles. Reynolds essentially puts on an emotionally intense one-man show, and a lesser performance would have utterly sabotaged Buried by allowing monotony to inevitably envelope Cortés’ milieu. 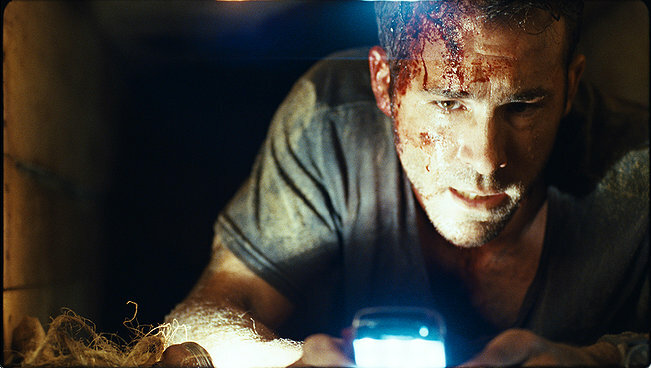 Instead, Reynolds shows his acting mettle, and in so doing hopefully digs himself out of his typecasting hole.